Twitter is an extremely important tool for any successful blogger. While you may know the gist of it, there are several things about Twitter that you may not be aware of. My day job revolves around social media marketing and therefore I spend an immense amount of time on various social media outlets; learning new things about social media and how to utilize it in order to get the results the client desires. I’d like to share a great Twitter tip that you may not be aware of and that may be beneficial to you as a blogger and a social media user. Did you know that if you tweet starting with @(username) such as when directing the tweet toward a certain person, the tweet will not be shown on all of your followers’ timelines? The most important thing is that you are now aware that this is how Twitter operates. 1. Do not share important, share-able information in tweets starting with a @ unless you only want very few people to actually see them. If you are sharing information that you would like to go viral or be seen by all of your followers, do NOT start the tweet with @(username)! Example: While the information I shared with Brother Fred is important because it contains my personal email, it is not something I want all of my Twitter followers to see. I do not want to share my personal email address randomly to show up on the main Twitter Feed and by starting the tweet with @(username), the only people that will see this particular tweet in their timeline are @brofroradio and people who follow BOTH of our accounts. 2. You do not have to feel bad about constantly posting tweets beginning with @ if you are having a Twitter conversation with another person/people on Twitter. I used to feel bad about having Twitter conversations because I was afraid I was cluttering up my followers’ feeds. Thankfully that is not the case, except for the followers which follow both you AND the user with whom you are talking. This is the same goes twitter chats; if you feel bad about cluttering up your followers’ feeds, just be sure to start the tweet with @(username) to be sure you are not “the annoying tweeter who posts every minute” during the twitter chat and shows up on all of your followers’ feeds. Be conscious that some users will go to your profile directly to look at your past tweets though, so it’s probably best practice to NOT actually have huge and prolonged conversations on Twitter publicly. Direct Message the user instead or Facebook them and have the conversation there. If you want all of your followers to (potentially) see a tweet that is directed at someone, simply don’t start your tweet with the @ symbol. Simple. If you are responding to a short tweet, I like to include the tweet in mine in case other followers may be interested to see what was being discussed and they get the straight Q&A kind of thing in one tweet instead of going back and clicking through to see the history of the conversation. I like to make it easy for my followers and I don’t want them to feel confused. Starting the tweet with a quotation mark automatically allows all of my followers to see the tweet rather than just the users who follow both me and the user I tweeted above. Hope this cleared up some confusion you may have had about these type of directional tweets and now you know how to use mentions on Twitter correctly, depending on whether you want everyone on Twitter to see it or just your mentioned user. 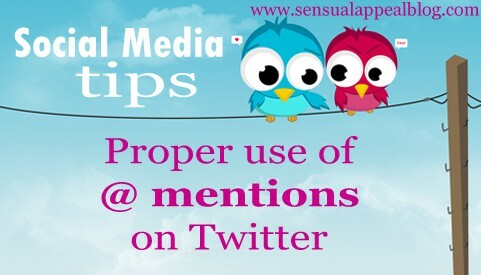 Did you know this Twitter tip? Have you ever felt bad before about posting a lot in a Twitter Chat or having a Twitter conversation with someone? I read last night that if you put a “.” before the @USERNAME everyone (not just people who follow you and the person you’re tweeting at) can see the tweet! Ha! Sneaky. Yep, I included that tip in the post! I’m so glad other people do the @ for everything in Twitter chats. Obviously the hosts of the Twitter chats would like a lot more exposure and for us to not use @ but I really don’t want to spam my followers. I didn’t realize that at all! Thanks for sharing! Thanks so much for sharing this info! I had no idea that starting a tweet with the @ symbol was such a powerful way of limiting it’s visibility! Yes, I did know that. But this is a good and informative post and you have explained it very clearly. Yeah it’s really difficult especially if the twitter chat involves a lot of users. It’s a matter of responding to the right ones and just being on your toes I guess. It can be fun though.